Catalign Innovation Consulting: Is your business model sticky? This is a roadside cobbler shop after the business is closed for the day. (Thanks to my friend and consultant S R Raja for the picture and the discussion on business model). 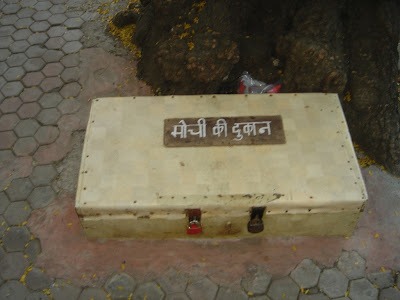 It displays the shop’s fixed assets which is a suitcase (more like a trunk) with “Mochi Ki Dukaan” written on top (which means “Cobbler’s shop”). What is unique about this shop is that the suitcase is cemented to the footpath (or sidewalk). Moreover, this happens to be a posh locality in Mumbai called “Five Gardens” in Matunga. What an innovative way of making the business sticky! “Stickiness” to me is analogous to “addiction”. Is your customer addicted to your products or services? The best example of stickiness is, what else, your favorite cigarette brand. You will be either a Wills-person or a Goldflake-person, not both (Similarly you are either a Times of India addict or Hindu addict – not both). Irrespective of the font size of the statutory warning on the cigarette pack or increase in tax levied by P. Chidambaram, you will keep buying your favorite brand. That is “stickiness” in cigarette business. In consulting business (the business I am in), unlike in cigarette or newspaper business, the stickiness lies not with any product or service but in the relationships you build. To quote Dr. Alan Weiss from his book “Million Dollar Consulting”: If you learn nothing else from this book, heed only this: Consulting is a relationship business. A special product may make you competitive. Differentiated services may make you distinct. But only carefully crafted relationships will create a breakthrough firm. No wonder veteran Strategy consultant V N Bhattacharya mentioned to me the other day, “Consulting has a long gestation period”. I guess “patience” is a foundational competence to enter this business (perhaps any business). If you are not there for a long haul, don’t even think about playing the game. I will be testing my patience (along with a few other competencies) when I run tomorrow in Bangalore’s 10K run. Are you game? Don't quite agree that the Cobbler's shop is "sticky", because it is physically cemented (or sticked, so to say). The photo makes a great observation though and the mochi in question may be a very clever person. What could make his business sticky, perhaps, are the stuff you've paraphrased from Dr. Weiss's book. Well, I did not mean that the business is "sticky" because the suitcase is cemented. One way to understand "stickiness" is by asking the question: Who controls the scarcest resource in the game? In some sense this reflects your competitive advantage. In the cobbler's business, one of the scarcest (if not the scarcest) resource is "location". He seems to have gained control of it. Hence the stickiness. This view is also known as "Resource Based View (RBV) of the Firm" in strategy literature. I agree with you that "location" by itself will not guarantee that customers will come back to you. Numerous firms connected with this industry concentrate more about how to commence a distinct venture. They deal mainly while using the essential behavior like study on fashionable items to manufacture as well as services presenting. They also check into discovering doable () places that are available to focus on customers.